Did you ever stop to think about the people behind historic art movements? A professor of mine once said that without wealthy patrons such as the Medici in Florence, the Renaissance would not have happened. As much as I despise the influence wealthy people have on society, I have to admit that without rich people buying art, we probably would not hear about artists such as Jan van Eyck, Antonie van Dyck, Rembrandt, Picasso, or countless other artists throughout time. Is this due to the fact that rich people have insight into art more than any others? NO! Most often in the past it was because the artist proved to be fashionable, displaying the latest tastes. What accounts for the advancement of abstract movements in American art after 1945, a genre that was notoriously entrenched in realism until the 1940s, then? I’ll say it once if I say it a thousand times: women have always had a major impact on art history, and Betty Parsons is one of THE most influential people in American modernism. 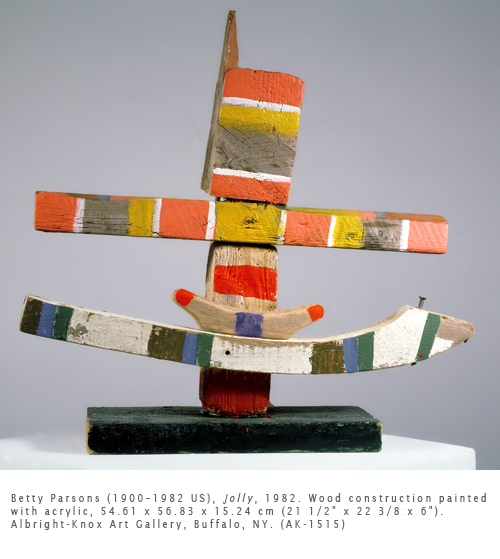 Betty Parsons was born into a wealthy family and studied with many different artists. Although she studied with many artists in Paris, the defining moment in her life was the 1913 Armory Show in New York, which introduced Americans to European modernism. She considered abstraction a “New Spirit” in art. After teaching art in California, Parsons returned to New York in 1936. Her early paintings were exhibited in the Midtown Galleries, where she was also offered a job. In 1945, Peggy Guggenheim closed her Art of This Century Gallery in New York, and Parsons agreed to take on many of the artists Guggenheim represented. Her first major show was that of Jackson Pollock in 1947. She subsequently went on to represent many of the nascent Abstract Expressionists, such as Barnett Newman and Mark Rothko. Clement Greenberg, the New York art critic who was the biggest “fan” of the New York School artists, once called her the “den mother of Abstract Expressionism.” She went on for three decades to represent avant-garde artists, including minimalists such as Agnes Martin, and color field artists such as Ellsworth Kelly. Her commitment to modernism is an extraordinary, if little reported, legacy in American modernism. Why do I sing the praises of Betty Parsons? Not only because of her art historical foresight, but also because she was an artist herself. I’ve never trusted art dealers who weren’t artists themselves. Parsons began her career as a painter and ended up producing constructions of found objects. Her works, greatly influenced by Surrealism and Dada, were composed of bits of wood she found on the beach near her home in Long Island. She called her works “carpenter’s throwaways.” The titles, such as Jolly, were extensions of the poetry she loved to write. Betty Parsons was a true American original who is little written about in mainstream art history texts. Her importance in promoting Abstract Expressionism, as well as other modernist movements, is incalculable. Activity: A found object sculpture: Using recycled materials (found objects), create a figurative sculpture. Select at least three objects to make a sculpture. Let the materials suggest ideas for the form of the sculpture. Using glue or tape, assemble the materials to suggest a human figure.